Arctic Snow and Ice Products Inc.’s revolutionary lineup of patented technology maximizes efficiency and operator safety while minimizing damage to private and municipal properties. Arctic Snow and Ice Products Inc., headquartered at 22763 S. Center Road, Frankfort, Ill., is perhaps the most respected designer of snow removal attachments in the world for commercial snow contractors. 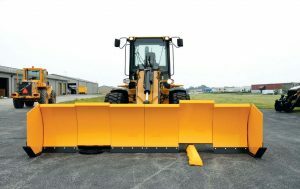 Its signature pusher, otherwise known as a box or containment plow, is the Arctic Sectional Sno-Pusher, and it has had perhaps the greatest impact on commercial snow removal since the very first plow was mounted to a truck or earthmover. The story of Arctic is really a classic American saga of one individual, his passion for snow, his unfailing commitment to be the very best, and when that is not enough, to be even better. That man is founder Randy Strait, and as he will tell anyone who will listen, the real key to his success with his products is the fact that he also plows snow for a living. Arctic Snow and Ice Control Inc., Randy’s service operation serving the greater Chicagoland area, is the nation’s largest self-operating snow removal company in the country with over 450 trucks, wheel loaders and skid steers, making it the largest privately owned snow fleet in the U.S. as well. It is the source of his design ideas as well as his built-in testing ground. Energetic young entrepreneur Randy Strait started a snow contracting business with a pickup truck and a plow to clear commercial properties and parking lots during one of the most severe winters in the city’s history. That year tested his wits and his will, as he dealt with extreme blizzards, fast moving arctic winds and mountainous drifts that kept him going nonstop for days on end, often with no sleep. When his truck would break down, he had to fight record subzero temperatures to get it back on the job again. This ultimate test of his determination and resolve inspired him to make this his life’s work. By 1998 Arctic Snow and Ice Control Inc. had grown into one of the country’s largest snow contracting operations. However, one fateful day plowing in front of a local Sears store, Randy Strait hatched an idea that forever changed his course and that of the industry. On that particular day, the store’s manager was outside and insisted no salting could take place in front of the store until the area was completely cleared of snow. The road was crowned in the middle and Randy’s 10-foot pusher teetered on the crown, so when it passed it still left a fair amount of snow behind. When he tried his 8-foot and then his 6-foot plow, each pass scraped incrementally more but could not finish the job. The manager saw this and rounded up six of his employees, equipped them with 30-inch shovels and had them stand side by side. He then had them move in unison back and forth where they were able to get into the depressions and clear the area completely. From that moment on, all Randy could think about was how he could mount those six shovels on the front of one of his machines. Eight years and five prototypes later, the Arctic Sectional Sno-Pusher™ was finally ready for the market, having been tested thoroughly on Randy’s own fleet over several seasons. This revolutionary design featured multiple independent moldboards with hardened steel cutting blades that raised and lowered to accommodate the contour of the plowing surface as well as any obstructions in its way. They could literally trip over obstacles as high as 9 inches, including manhole covers, curbs and boulders, any of which could have ruined a conventional plow. At the same time, they could drop below grade up to 9 inches if necessary to contour to depressions in the pavement. In addition to the independent moldboards, other features were added that cemented Arctic’s soon-to-be-made reputation. Spring-loaded trip edges and fl oating mechanical side panels were key performance enhancers and allowed for simultaneous street and sidewalk cleaning. Polyurethane cushioning blocks added another level of operator comfort and equipment protection. Best of all, his revolutionary patented Slip-Hitch™ universal mounting system revolutionized the way plows were mounted and operated for never-before-seen “Drop-and-Go™” capability. Arctic’s unique Slip Hitch™ Universal Coupler System, available on all its products, allows a quick “drop-and-go” connection to any manufacturer’s machine coupler without requiring the operator to leave the cab. The power-angled Arctic Sectional Sno-Plow™, new for 2017, offers municipalities an exciting alternative to their standard plows with never before seen performance, safety and cost savings benefits. 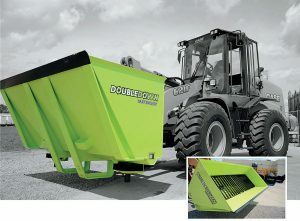 The DoubleDown Salt Bucket™’s unique technology off ers several advantages over conventional equipment, including independent augur controls, adjustable spinner controls and ejection points low enough to salt with precision under parked cars. Independently moving moldboards “trip” over obstacles up to 9 inches in height and move below grade as well the same amount to contour to uneven surfaces. 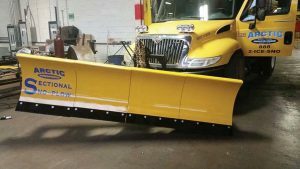 Th is year Arctic introduced the Arctic Sectional Sno-Plow™, a power-angled wingless plow with the same characteristics of the Arctic Sectional pusher but designed for the needs of municipalities performing on open roads. Now for the first time, municipalities can realize the huge financial and human benefits that commercial contractors enjoy with their sectional pushers. For starters, most report salt savings of up to 50 percent. Next, the tripping capabilities of the sectional translate into significant reductions in damage to private property as well as infrastructure such as sidewalks and curbs. Th e Sectional’s modular design characteristics also ensure a prolonged useful life and virtually eliminate the need for full replacement, preserving more of the municipality’s longterm funding allocations. Finally, safety is a major financial as well as human concern. The sectional technology prevents equipment damage and operator injury caused by sudden jolts when encountering a significant obstacle. Ensuring operator safety reduces worker’s compensation claims and can help lower a municipality’s insurance premiums while protecting the very families they serve. For more information, go to www.arcticsnowandiceproducts.com or call 1.888.2.ICE.SNO (1.888.242.3766). Peters is a contributing writer and consultant to the snow industry. It is pretty neat to see that there have been advances in the technology that we use to remove and plow snow. I just hope that my hometown hops on that train as they don’t do a very good job at it. I am good friends with a fair amount of people in the government there so I will probably mention something to them. If we went with the sectional pusher, that would probably do wonders for us.